The USS Echo (IX-95) was a flat-bottom sailing scow built in New Zealand in 1905. She was rigged as a topsail schooner, plying the waters of the South Pacific as a supply ship for 30 or more years before being loaned to the U.S. during World War II, at which time (1943) she was re-commissioned and brought into service for the war effort. Between 1943 and 1944 she carried Army cargoes over some 40,000 kilometers of ocean. Her other claim to fame is that she is the boat at the heart of the movie, The Wackiest Ship in the Army, starring Jack Lemmon and Ricky Nelson. 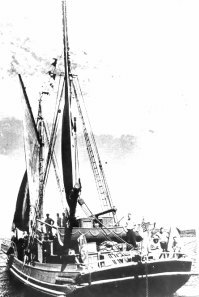 Although the real Echo could not be used for the making of the movie (the original vessel was still in service when the movie was made in 1960), the film makers found another schooner to take her place.